There is a spot in the French Quarter that you won’t find on any tourist map. No hotel concierge recommendation brings people here. This place is on the corner of Chartres and Iberville – north of the river and just south of the Acme Oyster Bar next to a couple of disgusting looking strip joints – in a rather seedy side of the Quarter. 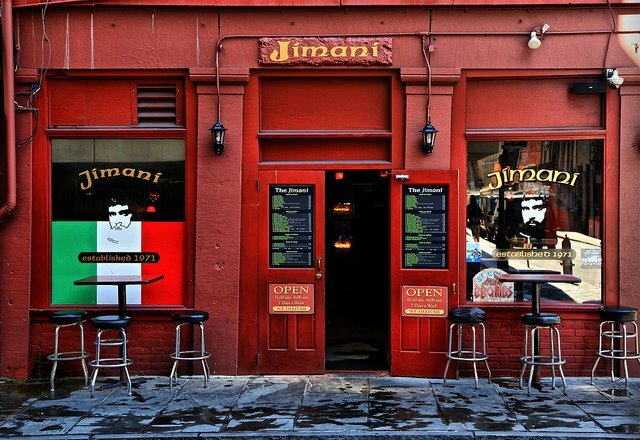 But despite an entrance that without knowledge seems most uninviting, the Jimani provides a can’t-miss slice of the New Orleans drinking scene. Neither a lounge nor a restaurant by common definition, the Jimani is a hole and a find at the same time. And that is meant as a compliment. With just about a dozen bar seats and maybe a half dozen tables, this is definitely a hole in the wall. And always dark no matter what time of day, the Jimani is a great place to escape the heat, the rain, the “I’m with Stupid” t-shirts, or the peddlers that are a part of life in the Big Easy. Places like this are hard to find in the French Quarter. In fact, the Jimani measures up to four basic tenants of a great joint: cold beer, great music, satellite sports on television, and a grill that can make a mean hamburger or chicken sandwich. At first glance one my think the griller is mean as well; an imposing man in a white T-shirt is usually the first person you see when you enter the small bar. The door is always open but it might as well be swinging. 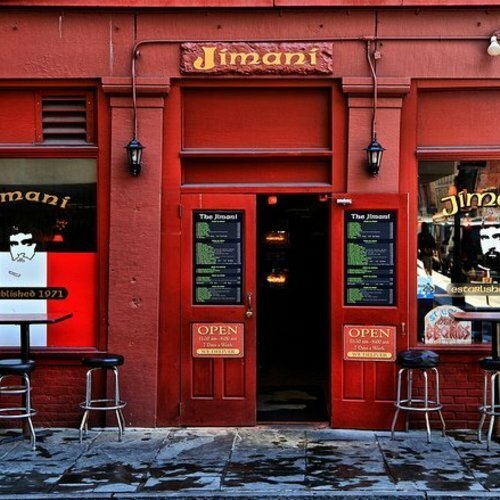 It seems like everyone that is part of New Orleans hospitality industry makes a pre or post-work visit to the Jimani, which means there are always people in the place. Business cards line the low ledge above the bar. The bartenders seem to have a personality reflective of the place, whimsical and efficient at the same time, and certainly give you the impression that they are familiar with the business end of a barstool themselves.